Do you have certain items that you bring with you every day "just in case" you might need them? Most people have an emergency car kit they keep in there car all the time "just in case" but I never thought of the importance of keeping certain items with me at all times when I leave the house. I found this awesome blog post that shares a list of Every Day Carry items that you should have. Lots of the things I already have in my purse without thinking about it (like chapstick, hand sanitizer and permanent marker) but there was also some things I hadn't thought of. I like how they said to weave things into your homemade paracord bracelets. I showed that to my husband because he loves making them and each of our boys have there own. 1. My Pocket Pistol – A small 9mm handgun because a good fight is one that never gets started. 4. 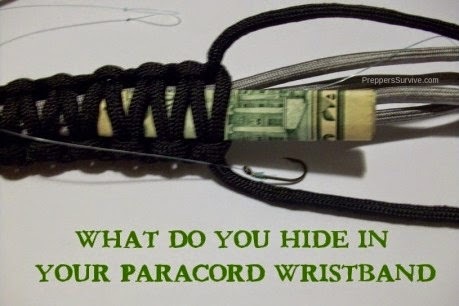 Paracord Wristband – Fish hook, cash, and a silver coin are woven into my homemade wristband. 5. Lighter – to lite the chapstick! Plus, you just never know when you might need a lite. 9. Permanent Marker – Notes to loved ones and part of my Emergency Communication Plan. 10. Hand Sanitizer – Cleanliness is next to godliness & hand sanitizer serves as lighter fluid. 14. Allergy & Pain Killer Medicine – Makes the day-to-day more enjoyable. Let us know what you have on your Every Day Carry list and why.